After small rest attend gala dinner at the Georgian national restaurant. 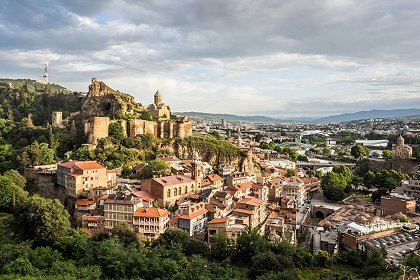 On this tour you will have a great opportunity to get acquainted with the two capitals of Georgia: ancient and modern, Mtskheta and Tbilisi. From the old to the new. You will get acquainted with the most picturesque and beautiful places. Mtskheta is one of the oldest cities of Georgia. 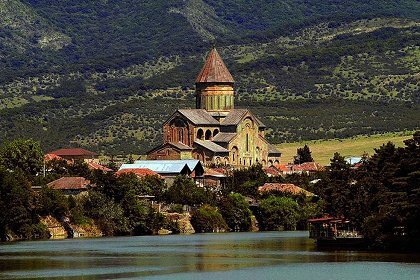 The architecture of Jvari monastery and Svetitskhoveli, inscribed on UNESCO’s list as the most ancient and respectful attractions worldwide. 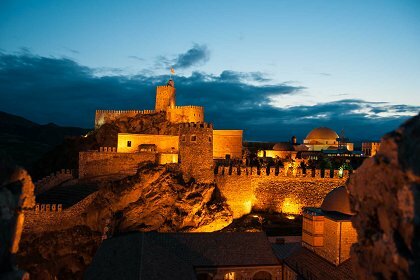 However, Tbilisi is not inferior to historical monuments of Mtskheta. You will see and learn about the history of the fortress of Metekhi, which destroyed and rebuilt many times, churches Sioni and Anchiskhati, sulfur baths, etc. Uplistsikhe, literally ‘Fortress of God’, is an ancient rock-hewn town which played a significant role in Georgian history over a period of approximately 3,000 years. Archaeological excavations have revealed extraordinary artifacts dating from the late Bronze Age all the way up to the late Middle Ages. 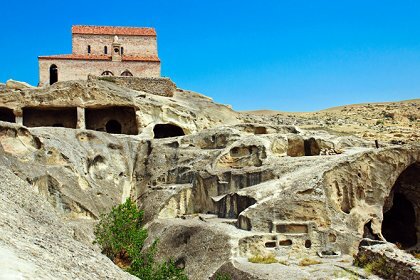 Accoring to Unesco, Uplistsikhe Cave Town-Fortress is situated on a rocky massif in 15 km eastwards to town Gori on the left bank of the river Mtkvari. The fortress is mentioned in chronicles from earliest times. Its history begins in the I-II millennium B.C. Uplistsikhe was an important religious, political and cultural centre in the Hellenistic and the late Antique periods (IV c. B.C. – IV c. A.D.). Stalin State Museum is situated in Gori, in the town where Stalin was born. The complex of the museum was opened in 1957. In the house, where Stalin was born, the memorial museum was opened in 1937, during Stalin’s life-time. The aggregate space of the museum complex is 3 529,7 sq.m. In the reserve stockes of the museum about 40 000 article exhibits, documents, canvases and auxilliary materials are kept now. There is a scientific library in the museum. Kakheti – wine region in Georgia. Indescribable beautiful road that runs through Gombori pass. 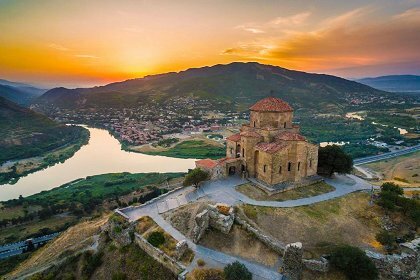 The one-day tour in Kakheti is a fascinating journey into the eastern part of Georgia, during which you can enjoy the mountain views, picturesque villages, ancient temples, and observe the life Kakhetians. Abundance of grape varieties with Georgia can compete only in France. The culture of wine as well as wine drinking in Georgia goes to the far-distant past, as the land goes deep into the root of the Georgian vine. Bodbe monastery complex of St. George, where are kept the remains of Saint Nino of Kappadokia. Sighnaghi – miniature city of love, which impresses with its history. It is the only city in Georgia that has fully preserved the fortress walls that are crowned with watchtowers, where one can climb to get the magnificent view of the Alazani valley. House Museum of Chavchavadze in Tsinandali – Tsinandali Palace belonged to the famous Georgian writer and public figure Alexander Chavchavadze and was a center of Georgian culture. On the territory of the palace is a garden, which grows more than 100 species of trees and shrubs. The museum houses a wine cellar, which has about 20,000 bottles of wine from different countries. «Winery Khareba – established upon the ancient traditions. The company works over maintenance of the unique vine culture and wine making both using ancient methods and modern technologies; consequently, the Company produces high quality wines. You will take part in activities like: making Georgia Bread, Churchkhela, and degustation of different sort of wines. 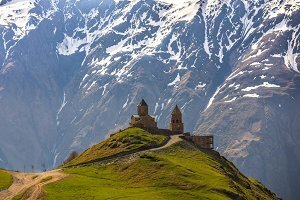 One-day tour to Kazbegi with the itinerary from the capital city Tbilisi to the snow-capped peak of the Mount Kazbek will open up an enchanting Georgia. Visit the scenic town of Stepantsiminda, where life ticks by at a relaxing pace. Take in top local attractions such as the 14th-century century Gergeti Trinity Church on the Chkheri River, and enjoy breathtaking views over the mighty Darial Gorge. After arrival in the village of Stepantsminda, hike to the church of Gergeti Trinity, with a wonderful view of the mountain. Important information: Gergeti Trinity Church is a popular waypoint for trekkers in the area, and can be reached by a steep 2-3 hour climb up the mountain, or around 30 minutes (6 km from the central square in the village Stephantsminda) by jeep up a rough mountain trail. Rabati Castle – medieval castle complex in Akhaltsikhe, Georgia. The fortress was built in the 13th century and was completely reconstructed in 2011-2012. Rabati castle developed under the influence of the different cultures over subsequent centuries and this is reflected in its architecture. 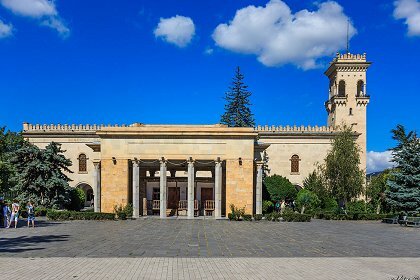 Within the 7 hectares castle complex there is a Church, a Mosque, a Minaret and a Synagogue. 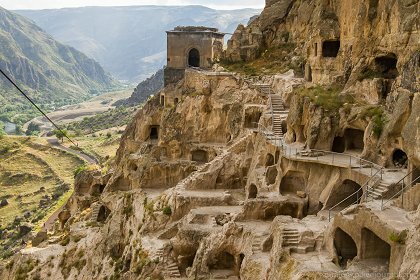 Vardzia cave town – is one of the highlights of the trip and stretches over half a kilometer along the river Mtkvari, with 19 tiers. There used to be about 3000 caves here, but now there are just over 500. It has a church hewn out of rock with amazing 12th century frescoes. The Complex also includes living quarters, small hall-type churches, and refectories, wine cellar, etc. Beautiful resort Borjomi – the world-famous mineral springs and beautiful Park Borjomi. In the park you will taste legendary and world famous Borjomi mineral water from the spring.